The Royal Shakespeare Company has announced the multi award winning musical of Matilda is coming to Milton Keynes Theatre as part of a UK tour. The show, which has won 85 international awards including 16 for the best musical, can be seen in Leicester from Tuesday June 5 to Saturday June 30 next year. Based on the book of the same name written by Roald Dahl will also tour to Dublin, Sunderland, Milton Keynes, Birmingham, Manchester and Cardiff. Tickets for Leicester, Dublin, Sunderland, Milton Keynes, Manchester and Cardiff will go on sale to the public on 26 April following a priority booking period between 19 and 25 April. Tickets for Birmingham go on sale on 9 May, after a priority booking from 25 April to 8 May. Further dates and venues are to be announced in due course. The West End production continues at the Cambridge Theatre, currently booking until 17 December 2017. The production will be accompanied in each location by a new education programme to engage young people, inspired by Matilda The Musical. From a travelling library of stories led by Mrs Phelps, to whole school takeovers of Matilda, the RSC aims to reach over 15,000 children, in collaboration with touring theatre partners. Tickets will be on sale from Wednesday April 26. 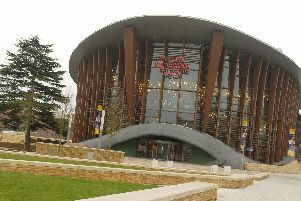 These can be booked by calling the box office on 0844 871 7652 or visit www.atgtickets.co.uk/miltonkeynes.